For much of Europe the seventeenth century was, as it has been termed, an “Age of Absolutism” in which single rulers held tremendous power. Yet the English in the same century succeeded in limiting the power of their monarchs. The English Civil War in midcentury and the Glorious Revolution of 1688 were the culmination of a protracted struggle between kings eager to consolidate and even extend their power and subjects who were eager to identify and defend individual liberties. The source and nature of sovereignty was of course the central issue. Did sovereignty reside solely with the Crown—as claimed theorists of “the divine right”? Or did sovereignty reside in a combination of Crown and Parliament—or perhaps in only the House of Commons—or perhaps, again, in the common law, or even in “the people”? To advance one or another of these views, scholars, statesmen, lawyers, clergy, and unheralded citizens took to their books—and then to their pens. History, law, and scripture were revisited in a quest to discover the proper relationship between ruler and ruled, between government and the governed. Pamphlets abounded as never before. An entire literature of political discourse resulted from this extraordinary outpouring—and vigorous exchange—of views. The results are of a more than merely antiquarian interest. The political tracts of the English peoples in the seventeenth century established enduring principles of governance and of liberty that benefited not only themselves but the founders of the American republic. These writings, by the renowned (Coke, Sidney, Shaftesbury) and the unremembered (“Anonymous”) therefore constitute an enduring contribution to the historical record of the rise of ordered liberty. 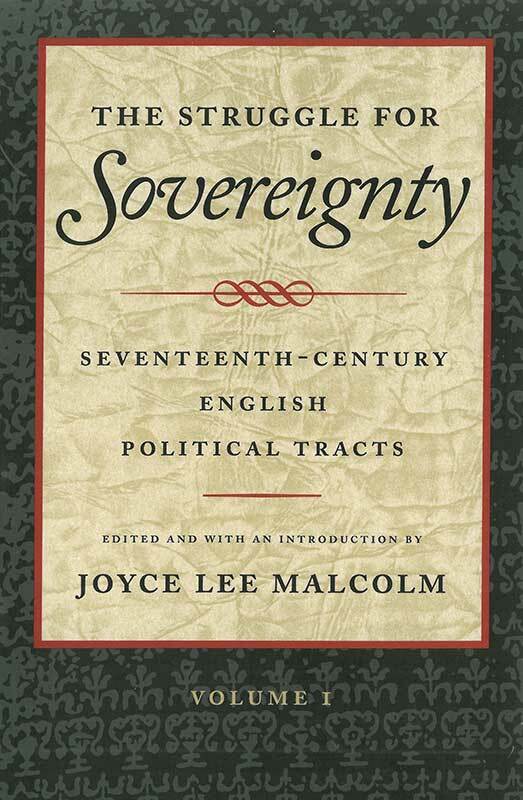 Volume I of The Struggle for Sovereignty consists of pamphlets written from the reign of James I to the Restoration (1620–1660). Volume II encompasses writings from the Restoration through the Glorious Revolution of 1688–1689. All of the major issues and writers are represented. Each volume includes an introduction and chronology. Vol. I, preface, introduction, chronology. Vol. II, introduction, chronology, index.